thoughts, ramblings & rubbish: He's probably a musical genius! I don't like to boast about K - in fact there very often isn't that much to boast about even though he's a wonderful little boy. He doesn't sleep well, has begun to throw temper tantrums all the time (it's quite funny actually - he throws himself onto the floor crying - sometimes he even gets a little floor slide going with the momentum of his downward fall), and he quite frequently puts his hands in his poop when his diaper is being changed. I also don't particularly like those mum's that do boast about their children - they p1ss me off, because to me they're just highlighting what a bad mum I am because K doesn't speak in full sentences; know how to count to 10; know to climb up a jungle gym by himself; read books with no pictures etc. etc. K has just mastered playing his guitar AND a harmonica at the same time! 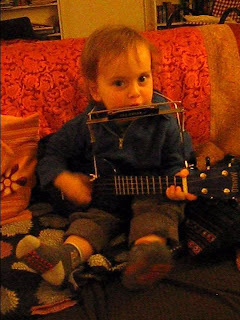 Now he's only 1, though he'll be 2 in just under 2 months - but I think it's pretty incredible and not just because I'm his mum, but because I can't play guitar and a harmonica at the same time.